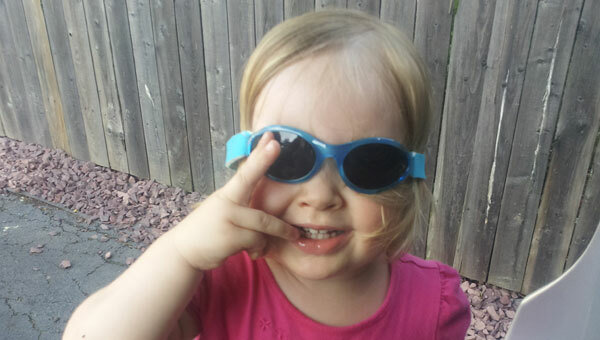 So cool, shooting the peace sign in her KidZ BanZ sunglasses. I always-always wear sunglasses. Just the other day, our whole fam took off for a road trip. A minute in and a block away, I discovered that they’d been left behind. Without my asking, my hubby knew to circle the block so I could run back in and grab them. They are imperative to my happiness in the daylight hours. It seems that my daughter has inherited my light-sensitive eyes because lately she’ll realize she’s sans sunglasses and start demanding her shades—usually when they’re not around. One day I even had to turn mine over for her to wear, lest we have a refusal to finish the walk we were on. So I was pretty excited to get some Baby BanZ sunglasses for my daughter to test out. The timing was great, too—just a day or two later, my daughter’s (third? fourth?) pair of sunglasses broke. Baby BanZ sunglasses aren’t just for looking cute on the under-5 set, either—although they do look pretty darn adorable. They’ve got UVA and UVB protection, and I think they’re a good opportunity to introduce eye protection early, even if like everything else, it’ll take time to become a habit that sticks (so often the “new” becomes just another toy!). They come in Baby BanZ sizes for kids 0 to 2 and KidZ BanZ sizes for kids 2 to 5 (and then there are Junior BanZ for kids 4 to 10!). The strap is a neoprene elastic, so it’s super flexible and comfortable, plus much less likely to break than the plastic sides of typical sunglasses. The Velcro is adjustable so that you can adjust around heads as they grow for just the right fit. In fact, they’re more likely to come off because your toddler changes his or her mind about wearing them—not because they just slip and fall off. They’re built for rough-and-tumble play of kids, too. The frames are shatter resistant and the lenses are durable too. So far? They haven’t broken. And at under $13 on Amazon, I’d say they’re worth it. And just in case you’re out in the sun as much as we are in the summer, the company also has a full Baby BanZ Protection Collection that includes baby and toddler sun hats, UPF 50 swimwear and flap hats, and more. We LOVE Baby Banz at our house! Our 9mo son is pretty good about keeping them on when we’re outside (so far!). I do find they don’t stay on very well when his head is against something (i.e. carseat or stroller) – they tend to end up around his neck very quickly because of the rubbing between head and seat.